This is going to be a very short version of the actual event at the border due to the protection of our personal information. We crossed on the US Thanksgiving and instead of a lighter interrogation as we expected we received the full monty. Where are you going, how many years have you been doing this, how much alcohol do you have, do you own a home in Canada, and so on and so on and then the big question, how much cash are bringing into the US? Legally we are each entitled to bring in $10,000.00 cash or so we thought. First stop was a few meters down the road for an agricultural inspection. Big joke! He looked at nothing and merely asked if our dog food was made in the US. I offered to show him the package and he said not important as he believed me. Then came the hard part. We were both to report into the office with all of the cash we were carrying with us including the pennies. First I had to fill in a form for the both of us. When asked I was told that no we did not each need to fill in a form, one for the two of us was sufficient. No we did not have any addresses in the US that we were staying at. 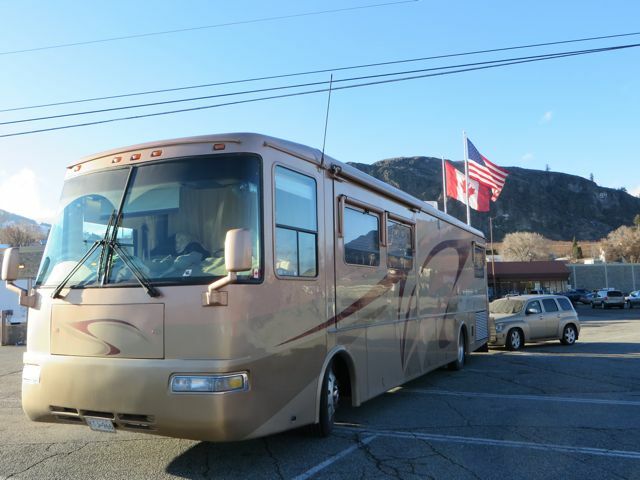 We were simply transiting the US and not certain where we would be spending the night. Yes were headed to Mexico. Yes we have been doing this for 15 years now. Once the form was filled out we both were to follow the agent, actually they call then officers now as I was informed. We passed thru 4 sets of looked doors, it was somewhat intimidating. Then we arrived to a very distant area of the building where another officer showed up and then we were informed that the two officers would count our money. The Canadian funds were easy, $70.00 in 3 $20.00’s and 2 $5.00’s. Took them 2 times to get it right. Oh my I thought, what is going to happen when they get to the pesos? The US funds were fairly easy as they were all in $100.00 bills but they had to count them over and over again as they kept forgetting to write the figure down. I was itching to take over and direct the entire operation but kept quiet. Then I opened the two envelopes of pesos, all in 20, 50 and 100 peso notes. Both officers nearly gagged. They really had no idea how to proceed with system and order nor how to count nor document what they were counting. It did not take long before both Colin and I were suggesting how to proceed, how to count and how to write down the amounts. At one point I asked if it was possible to get a calculator. It turned out that I was the only one keeping track and on the back of an envelope at that. Colin was doing calculations in his head. We soon came to realize that these guys had never done this before and had no idea what they were doing. Yet we were being told we were in the wrong. We just did not know why we were in the wrong. I had a master piece of paper with all three currencies listed and the amounts I had of each and the date of the purchase and the exchange rate from the bank and then the grand total in Canadian dollars. So we all finally got thru the big count and they got a total, less than mine but that was okay by me cuz it made me look like less of a crook. Then they asked me what the exchange rate was for that day to convert it to US dollars??? Hello, how do I know? Not my job. They had no idea what to do. So I suggested a figure and they went with it. They they called in their big boss ( and he was big ). I have to mention that there were about 18 agents/officers just sitting around at various desks doing nada. This big boss came out of a segregated office. I asked what the problem was and he explained that we were allowed to take as much money as we wanted over the border, even millions in cash, but it had to be imported. I replied that we were allowed to bring in up to $10,000.00 across with no issues. Yes he agreed, but we had over that amount. Yes I replied but we each could have 10,000.00 and we were under that amount. Oh no he said, that is $10,000.00 for the two of us. We went back and forth, we were each entitled to that amount and he said no. We were married and then meant 10K for the both of us and so on and so on. I knew he was wrong as I has researched this. Then came the cruncher, had we informed Canada that we were taking this much money out of the country????? We have been doing this for years and years with no such episode. He decreed that we had to go back to Canada to report this incident. We were to leave the dogs and the RV and walk back across to Canada to deal with this infraction. I meekly requested that our passports be returned to us as we walked back into Canada. The US guy had forgotten that they were up front on the counter…not me. If I was changing countries I wanted my passport with me. So off we trotted back into Canada under a US guard. The first Canadian officer gave us such a negative look, like what have you two done wrong. Shortly after turning us over to the Canadians the US guy took off. I was finally able to logically explain the situation. A quick look and a ” I will be back, wait ” and we were justing standing there wondering what was going to happen next. Over 5 minutes later the same negative looking guy comes back with a sly smile on his face. Bottom line he agrees with me. We EACH get $10,000.00 and it is not a concern to the Canadian government. However he has no control over what the Americans decide to do. We walk back to the US and find the door literally locked. Finally someone lets us in. We have to sign here, here and here and oh what is your license plate number. We were finally free to go but be careful if you do it again. Do what again? We did nothing wrong. Perhaps this bunch of ‘officers’ had too much time on their hands this particular day. We know that we were in the right and that none of this needed to have happened. You can be assured that next year I will have print outs of all the required documents. But the big question is….why is that fact that that we are a couple mean that we forfeit our individual rights. As Mr. Big Boss said that is just the way it is, if you are a couple you are no longer individuals. Where is the logic I ask. Each person files a customs declaration, etc. whether you are married or not. A huge waste of our time. I do not want to hear about why we should not bring so much cash into the US or Mexico or that we should do things differently. We do what we do for our personal reasons ( which mostly are a cost savings to ourselves and a convenience to us ) and it is totally legal. This last border fiasco was a blatant misinterpretation of the law by non thinking individuals. I won’t let it happen again. I intend to have the proper documents to show that I am correct. After all if the Canadian officers, the representatives of the government decree that I am correct what else can I say. Oncer thru the border we stopped for some groceries and wine. Welcome to the USA. 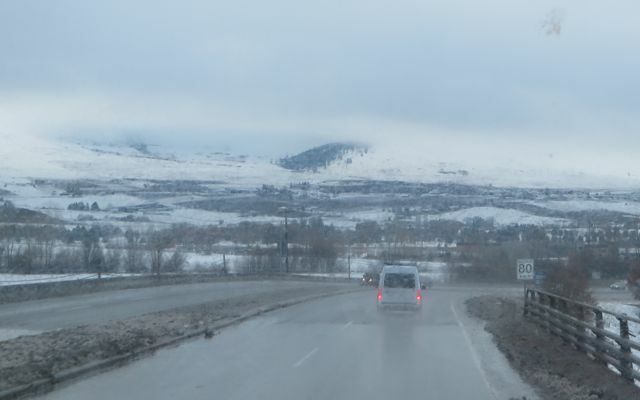 This was the highway out of Kelowna just 3 days ago when we left. Now they are experiencing some of the worst conditions in years if not ever. Temps down to -25C with the wind chill. 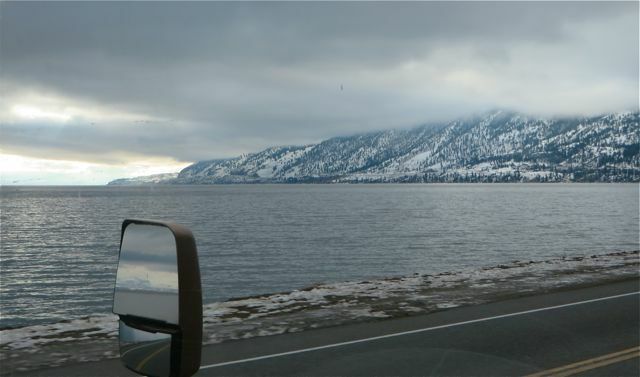 Just to show you how low the snow line was. I liked this shot as it showed some light and sun towards the south. Back to the present. Had a great sleep at Walmart in Mountain Home Idaho last night and got some retail therapy in. Great for the mind and the soul. This morning it was a cool 41F but very tolerable. On the road about 7:30AM. 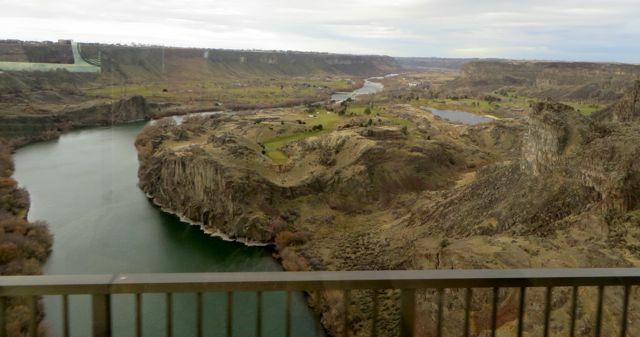 Love this view coming into Twin Falls, Idaho. Very scenic but today extremely windy. Colin said it was the worst wind of the trip. Just a few miles before crossing into Nevada we came across this very obviously serious grass fire. It looked like the land owners had been able to round up their cattle and move them to safety. The line of dark mid way are the cattle. Tough to get a good shot at 50 MPH. Colin was down to 50MPH most of the day due to the extreme winds. We had a good day other than the wind with only a brief rain squall in Wells while fueling up. Tonight we are at an RV park in Ely, Nevada. With expected temps down to -4C we are not taking any chances. We are dumped and full of water as we will be boondocking for the next 6 days. Our living room slide has not been out for over a week and tonight the bedroom slide will be brought in at bedtime. We do not want to risk any problems with freezing. Hard to believe that one year and one month ago exactly to today’s date we had frozen slides right here in this park. Yes that was the end of October, 2013. Not going to take a chance tonight. With the promise of sun and warmth only four hours away we want to be ready to leave first thing in the morning. Off to Vegas in the morning. I was finally able to speak to my Dad tonight for the first time since we left. It was hard for me to hear his weakness and barely able to hear his voice. At least he has no pain, he just has trouble breathing. He said that if he could get two good deep breathes per day he could make it thru to the next day. He told me he was disappointed that he was not getting better. Sadly I had to explain yet again that he was not going to get better. He paused and said “then I just have to get used to living like this”. Tough conversation. I always enjoy reading about your trip down to warmth and sunshine. Wish I could follow you. Sorry to hear about your border difficulties, but sometimes you’ll get some official on a power trip. I got stopped crossing from California to Arizona in my truck with my cat. They said that their search dog flagged me for possible drugs? I had to sit outside with my cat while they searched the truck. I was somewhat concerned as I worked at a veterinary clinic in a sketchy neighborhood. They found nothing, and as I left, I suggested that their search dog was easily distracted, and needed neutering. Got away with it too! Sometimes those boarded crossings can be frustrating, but you did finally get through all the aggravation. There is no winning at the border, you were hassled for large amounts of $$, a few years ago we were asked “how are you going to support yourselves?” when we indicated that we had about $3,000 in cash with us. I guess the agent didn’t understand or use ATM’s. For what it’s worth, both of us now have the new chipped passports, that seems to get us across more quickly. So sorry for the issues at the border. It doesn’t seem to matter if you are Canadians crossing to U.S. or Americans crossing to Canada, every once in a while you get to deal with officious idiots on both sides. Hopefully the rest of your trip will go more smoothly. Welcome to the U.S.A. ! They worry about the small stuff and then allow 40 billion in illegal drugs and another 40 billion into the country to be laundered. I think they hit the border crossers as a distraction from the real problems. Be safe. Ah, the Excited States of America. The faster you get to Mexico, the better. Well that crossing makes ours sound easy. They asked us how much money we had and when we hesitated asked, “more that $10,000?” we said no and that was that. Except for searching everywhere. I wish they would send the officials to the OK. Panhandle. We have a blue million illegals floating around down here and NO ONE doing anything about it. Well, what snots!!! Sorry that had to happen to you. Distressing at the best. Glad you had contact with your Dad. To hear his voice must have been helpful even tho you know what is happening with him. Taky3yae care with that wind…. Geeeez…..what a horrible border crossing. How can customs officers behave so stupidly. that border crossing was very bizarro…..